Sri Lanka's second-string side emerged with a moral victory after bowling the tourists out for one run fewer than they themselves managed on Monday. With this two-day warm-up match officially a two-innings affair, the match ended in a draw. 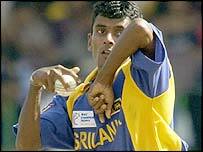 But Sri Lanka spinner Upul Chandana had a fine day, taking 5-98. Mark Richardson, who hit the highest score in the Black Caps' only other warm-up match, was again the leading performer with the bat. The opener collected 93 this time before falling to Chandana's leg-breaks. By then, five top batsmen had already fallen by the wayside, Jacob Oram's 26 the best effort among a collection of failures. Wicket-keeper Robbie Hart held together the latter half of the Kiwi innings with a patient unbeaten 34. But when Russel Arnold took the final wicket by bowling Shane Bond for six, the home team could argue with some justification that they had enjoyed a better day and a better match. New Zealand's second highest score was extras, with 38, as the Sri Lanka A bowlers produced 15 no balls. Bowling: Lakshitha 14-3-51-0, Ranjith 16-3-44-2, Chandana 33-9-98-5, Mirando 12-3-44-2, Arnold 9.5-1-23-1.